I have been asked to see what I can do for a themed alpha legion army using the new chaos space marines book and with as much raptor, cultist, apostle, warp talon, maulerfiend and chosen. I think alpha legion have been spoiled for theme choices with this new incarnation, you just have to be creative and use a little imagination. Im going to omit the warp talons, maulerfiends and chosen. They work in different types of lists. Warp talons simply dont fit the theme well and cant take advantage of the way this army plays without losing on the blind ability. Chosen are also the weaker choice with shorter range, not scoring ever and high cost. Maulerfiends are fun, but with so much combat already in the list, they will a. lack targets and b. occupy now valuable heavy support slots necessary to down threats and transports the maulers cant reach in time. 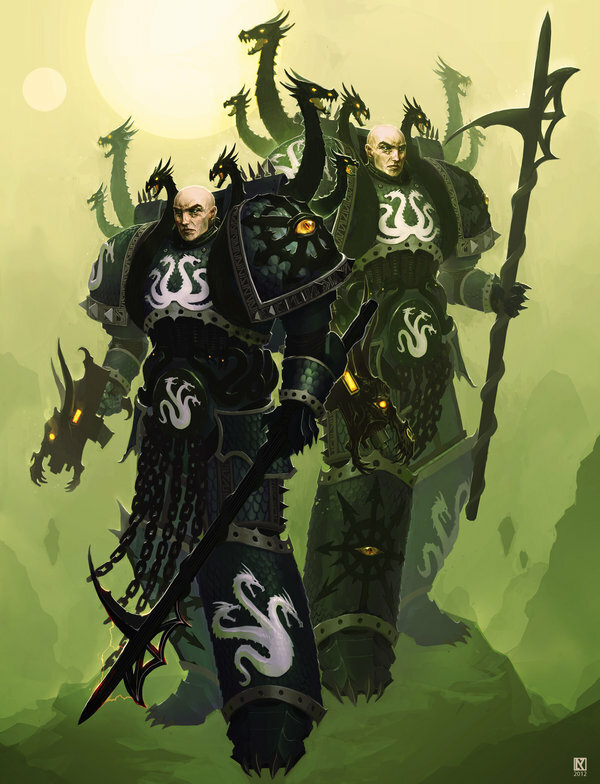 The first thing I think of when I think Alpha Legion is infiltrate. None of the units in this book have it specifically (poor chosen), however, there is a warlord trait that makes D3 units infiltrate. You can try chancing it with a generic character roll on the chart or you can stretch the imagination a bit and take on of the special characters that get it standard. We're going to pass over Ahriman and look at Huron. Huron gives us the infiltrate rules as well as a little utility with the hamadrya. Convert up your own lord to match the weapons and his pet and voila.The little lizard (lizard, alpha legion, present from the Cabal, etc tell me how this doesnt work fluff wise) gives chaos its only acces to the divination discipline but no prescience. Still a great discipline and more utility is what we want. With our HQ out of the way, I want to look next at what will best ultilize the infiltrate ability. Because, jump units follow the rules for both the parent type (in this case infantry) and Jump Infantry , jump infantry qualify for the infiltrate ability. This opens up first turn charges if the chaos player is going second. On his request list, raptors fit the bill nicely. With dedicated assault units, you need to go big or go home because they are going to take some firepower going in and after they blow up the first unit theyll likely take another round to the face. Marks allow us to have both speed and resilience with the mark of slaanesh and its icon, +1 Initiative and feel no pain are an awesome tandem on assault units. Veteran is also important here to make sure they stay put. We'll take two units and play for the averages. Now onto our troops. With Chaos Lords, Im normally an advocate for giving them a daemon weapon, throwing them in a unit of cultists for ablative wounds, but with Huron I wouldn't say he has the Killing Power to take units on his own so lets take a larger squad of marines. For the remainder of scoring, were simply going to abuse the cheapness of cultists. 4 Times. These will go in reserve and make their way toward objectives and go to ground. If we have the points by the end of this we will take an Apostle, consolidate 2 units into one and use the blob more agressively. Looking at this we have spent 1353 leaving us with 495ish to play with our heavy support choices. We really need something to at least make flyers nervous and can open up transports at range. I like havocs, but flakk havocs are super expensive and will simply be the first target of any flier. So Im looking at the forgefiend. 8 Str. 8 shots will scare flyers and will reliable wreck tansports. They also have the head of a Komodo Dragon (lizard/theme). I want two. 127pts to spend. Lets drop the meltaguns down to flamers on the Khorne Marines and consolidate two of the cultist squads into one. Lets purchase that Apostle. He gives the whole unit fearless and hatred and with the mark of khorne now gains counterattack. Lets give him the Axe of blind fury to make this unit actually scary. We've got 7 points left over so lets give the Marine Champ a meltabomb. Lets final draft this thang.